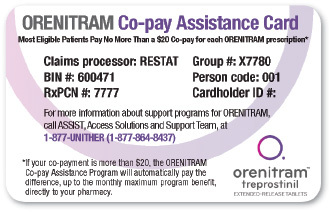 Once you have received a prescription for Orenitram, there are additional programs available that may be able to assist you. If you need help, call your ASSIST advisor. 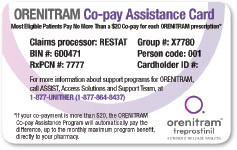 An ASSIST advisor is available to discuss financial assistance for patients who have been prescribed Orenitram. If you are interested in learning more, or to find out if you or a loved one is eligible for financial assistance, ask your ASSIST advisor. Call ASSIST at 1-877-UNITHER (1-877-864-8437). A dedicated ASSIST advisor is available to discuss financial assistance for patients who have been prescribed Orenitram. If you are interested in learning more, or to find out if you or a loved one is eligible for financial assistance, ask your ASSIST advisor. ASSIST can be reached by calling 1-877-UNITHER (1-877-864-8437).